The US diplomatic and military chiefs paid an unprecedented joint visit Wednesday to the border with North Korea in a show of support for South Korea after a deadly naval attack blamed on Pyongyang. Watched through the window by a curious North Korean soldier, Secretary of State Hillary Clinton and Defense Secretary Robert Gates entered a meeting room straddling the borderline and briefly set foot on the North's side of the room. Clinton and Gates are leading a high-powered US delegation to the South as a gesture of solidarity following the sinking of a warship in March that killed 46 sailors. South Korea, its US ally and other countries, citing findings of a multinational investigation, accuse the North of torpedoing the Cheonan warship near the disputed sea border -- a charge it denies. 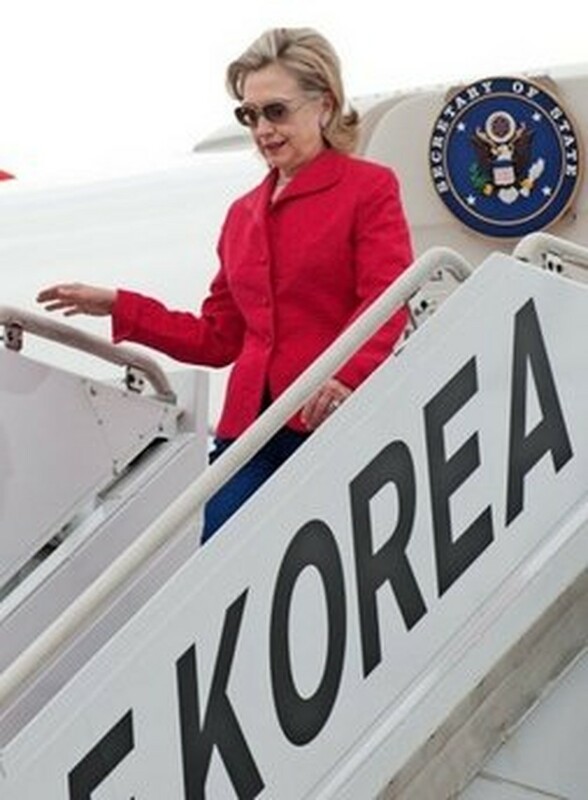 US Secretary of State Hillary Clinton arrives at Seoul Air Base on July 21, 2010. The incident has sharply raised tensions on the peninsula. Gates and his South Korean counterpart Kim Tae-Young Tuesday announced a major joint naval exercise starting this Sunday as a deterrent to the North. Clinton and Gates, visiting the border truce village of Panmunjom in heavy rain, talked to US and South Korean soldiers posted there. Unlike the rest of the heavily fortified Demilitarised Zone (DMZ) bisecting the peninsula, the border at Panmunjom between communist North and capitalist South is marked only by a low line. "It struck me that although there may be a thin line, these two places are worlds apart," Clinton told reporters. 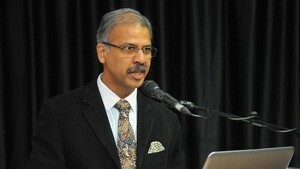 "The Republic of Korea (South Korea) has made extraordinary progress. In contrast, North Korea has not only stagnated in isolation, the people of the North have suffered for so many years." It was Clinton's first visit to the DMZ area, which her husband -- then-president Bill Clinton -- described during a 1993 visit as "the scariest place on earth". "We continue to send a message to the North that there is another way," she said, referring to US pledges of major aid if Pyongyang scraps its nuclear weapons programme. "Until they change direction the US stands firmly on behalf of the people and government" of South Korea. Gates also noted that the South continues to grow and prosper. "The North, by contrast, stagnates in isolation and deprivation. And as we saw with the sinking of the Cheonan, it continues its history of unpredictable and at times provocative behaviour." He said the Panmunjom visit was intended to show appreciation to US and South Korean troops maintaining the armistice that ended the 1950-53 war, "but also to send a strong signal to the North, to the region and to the world that our commitment to South Korea's security is steadfast". The top US military officer, Admiral Mike Mullen, also voiced concern at Pyongyang's perceived unpredictability during a visit to US troops at Camp Red Cloud, around 30 kilometres (20 miles) from the DMZ. The DMZ, whose approaches are guarded by minefields and razor wire, has bisected the peninsula since the war. The US has stationed troops in the South ever since the conflict, and currently has 28,500 there. "We are all concerned, all the neighbours, concerned about what happens in Pyongyang, and where this leadership goes. He's a pretty unpredictable guy," Mullen said, referring to leader Kim Jong-Il. "The last thing in the world that I want to see happen, that anybody wants to see happen, is to have conflict break out." The man nominated to head the US spy community told US senators in Washington Tuesday that he fears a possible "dangerous new period" of direct attacks by the North on its southern neighbour. James Clapper was making a written response to questions by members of the Senate Intelligence Committee. Clinton and Gates later visited the War Memorial in Seoul to pay tribute to the war dead and the sailors killed in the Cheonan. They were to hold "two plus two" talks Wednesday afternoon with South Korean counterparts, and issue a joint statement expected to touch on ways to strengthen the alliance and deal with North Korea.